Water hammer. It's a familiar sound nearly everyone has heard in their own home when someone slams a faucet closed. You have probably also heard it coming from radiators during the winter heating season. In industrial situations, though, water hammer is more than just a noisy annoyance. Water hammer that results from localized abrupt pressure drops may never be heard. Yet water hammer can acquire great force, damaging equipment, ruining product, and potentially putting personnel at risk. Water hammer begins when some force accelerates a column of water along an enclosed path. The incompressible nature of water gives it the power of a steel sledge as it slams into elbows, tees, and valves. The resulting vibrations are transmitted along the water column and piping, damaging fittings and equipment far removed from the problem source. Water hammer can occur in any water supply line, hot or cold, and its effects can be even more pronounced in bi-phase systems. Bi-phase systems contain both condensate and live or flash steam in the same space. Heat exchangers, tracer lines, steam mains, condensate return lines, and in some cases, pump discharge lines, may contain a bi-phase mix. Three distinct conditions have been identified, which provide the force that initiates water hammer. These conditions, hydraulic shock, thermal shock, and differential shock, are common to many industrial fluid applications. However, following a few simple guidelines will help you minimize the occurrence of these shocks and diminish the chance of damaging water hammer. Hydraulic shock occurs when a valve is closed too abruptly. When a water valve is open, a solid column of water moves from its source at the main to the valve outlet. This could be 100 pounds of water flowing at 10 feet per second, or about 7 miles per hour. Closing the valve suddenly is like trying to instantly stop a 100-pound hammer. A shockwave of about 6600 psi slams into the valve and rebounds in all directions, expanding the piping and reflecting back and forth along the length of the system until its momentum is dissipated. By closing the valve slowly, the velocity of the water is reduced before the column is stopped. Since the momentum of the water is decreased gradually, damaging water hammer will not be produced. Sometimes, check valves can produce hydraulic shock. Swing check valves are often used to prevent liquid being drawn into spaces that are subject to intermittent vacuums. They are also applied to prevent back-flow from elevated systems when adequate pressure to raise the liquid cannot be guaranteed. In either case, the acceleration of the reversing column of liquid may be quite high. If the swing length of the check valve is sufficient, the column will build enough inertia to cause hydraulic shock in the time it takes the valve to slam shut. Substitute silent or non-slam check valves for swing checks to prevent water hammer in these situations. Silent check valves are center-guided to provide a much shorter stroke than swing checks. These valves also use a spring to help enclosing. The result is that silent check valves are closed by the loss of upstream pressure rather than the reversal of flow, preventing hydraulic shock. Water hammer arresters, if correctly sized, placed, and maintained, will reduce water hammer. When the forward motion of the water column is stopped by the valve, part of the reversing column is forced into the water hammer arrester. The water chamber of the arrester expands at a rate controlled by the pressure chamber, gradually slowing the column, and preventing hydraulic shock. To prevent water hammer due to hydraulic shock, avoid suddenly stopping water columns. Ensure slow closure of valves, and install spring-loaded, center-guided, non-slam, or silent check valves that close before flow reversal when appropriate. Use water hammer arresters if necessary, but be sure they are sized and placed correctly, and are well-maintained. Water hammer may also be initiated by thermal shock. In bi-phase systems, steam bubbles may become trapped in pools of condensate. Since the condensate temperature is usually below saturation, the steam will immediately collapse. Steam occupies hundreds of times the volume of an equal amount of water. When the steam collapses, water is accelerated into the resulting vacuum from all directions. When the void is filled, the water impacts at the center, sending shockwaves in all directions. One likely place for thermal shock to occur is in steam utility corridors. In these areas, the drip traps from high-pressure steam mains often discharge directly into the pumped condensate return lines. The temperature of the condensate in these lines usually ranges from 140 to 180 degrees Fahrenheit. The condensate being discharged from the steam trap is at nearly steam temperature when it passes through the trap orifice. When the trap discharge enters the low-pressure condensate line, a great deal of it flashes back into steam. The flash steam immediately collapses again when it encounters the relatively cool pump discharge water. 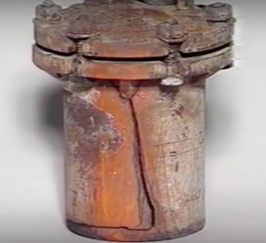 This thermal shock often causes damaging water hammer. The localized sudden reduction in pressure near the wall chips away piping and tube interiors. Oxide layers that otherwise would resist further corrosion are removed, resulting in accelerated deterioration of piping and equipment. To minimize such a disturbance, the drip trap should discharge in the direction of condensate flow by means of a special fitting. This method of controlling thermal shock, called "sparging," reduces the concentration of collapsing steam bubbles, and keeps the action from occurring by the pipe wall. Thermal shock can also occur easily in steam coils if they are constructed as shown here. Since the steam is directed toward the center tube first, it can reach the return header before the top and bottom tubes are filled. Consequently, steam feeds the more remote tubes from both ends. With steam flowing into both ends of a tube, waves of condensate flow toward each other. These waves have the potential of trapping pockets of steam between them. If this happens, thermal shock will result when the pocket of steam collapses and water hammer will probably occur. Prevent the thermal shock that is generated by such a design by substituting a constant-purge device, such as a differential condensate controller, for the steam trap. Condensate controllers maintain a positive differential pressure across the coil at all times. All the tubes will be fed from the supply end only, preventing the entrapment of steam and the resulting thermal shock. Malfunctioning steam traps may also contribute to thermal shock followed by water hammer. A steam trap that has failed open injects live steam directly into the condensate return line. If this steam is mixed with return line condensate of sufficiently low temperature, it will immediately collapse, and thermal shock will follow. To prevent the occurrence of water hammer due to thermal shock, you must reduce the concentration of collapsing steam bubbles in the condensate. If flashing condensate must be discharged into a cool condensate line, it should be discharged in the direction of condensate flow and away from the pipe wall. Precautions must be taken that heat exchanger tubes are always filled from the supply end only. Differential shock, like thermal shock, occurs in bi-phase systems. Differential shock can occur whenever steam and condensate flow in the same line, but at different velocities, such as in high-pressure condensate return lines. In bi-phase systems, the velocity of the steam is often ten times the velocity of the liquid. If this gas flow causes condensate waves to rise and fill the pipe, a seal is formed with the pressure of the steam behind it. Since the steam cannot flow through the condensate seal, pressure drops on the downstream side. The condensate seal now becomes a piston that is accelerated downstream by virtue of this pressure differential. As it is driven downstream, the piston picks up more liquid that is added to the existing mass of the slug, and velocity increases. This is differential shock. If the slug gains high enough momentum, and is then required to change direction at a tee or elbow, or is stopped by a valve, great damage can be done. In the demo lab at Armstrong International, a fixture was assembled to illustrate the problem with a 20-foot, 2-inch-diameter glass pipe to act as a condensate return line. The pipe is pitched one-quarter inch in 10 feet to provide gravity flow. Flowing through the pipe, we have cold water. In addition to water, we can also have compressed air flowing in the system to simulate flash steam flowing across the top of the condensate by virtue of differential pressure. One flow meter constantly measures the flow rate of the water. Another flow meter continuously monitors the flow rate of the compressed air. As you can see, we now have 1500 pounds per hour of water flowing in our glass pipe, and no compressed air. Under this condition, our pipe is approximately half-filled with water. As we increase the flow rate of water in our pipe to 2,000 pounds per hour, the depth of the water increases to five-eighths. We now introduce compressed air into the system to simulate flash steam with a flow rate of about 200 standard cubic feet per hour, and the depth of the water recedes. We are increasing the speed of the water flowing through the pipe by virtue of the velocity of the gas flowing across its surface. Observe now as the compressed air flow increases. The waves formed on the surface of the condensate become higher. Further increasing the air flow causes the waves to block off more of the cross section of the piping until a seal is formed, completely closing off the pipe. A slug of condensate is accelerated downstream by the pressure differential, becoming a piston that gains in mass and velocity as it travels. The proper sizing and pitching of condensate lines are the only means of guarding against this type of problem. The Armstrong Steam Conservation Handbook includes a chart that helps you in deciding the correct condensate return line size for your particular application. Differential shock can also become a problem when elevated heat exchange equipment is drained with a substantial vertical drop ahead of the trap. Under normal conditions, condensate drains down the walls of the pipe. A sufficient volume of steam constantly flows down the center of the pipe to replace the steam that is condensed by radiation losses of the piping and the trap body itself. The steam flow rate increases if a thermostatic element, such as the bellows or wafer in an F & T trap, opens. If a slug of condensate seals off the pipe, steam collapses downstream of the seal. Again, a pressure differential forms, and this, along with gravity, accelerates the slug. When this piston strikes the trap, it can damage the float, the thermostatic element, or other parts of its mechanisms. To avoid differential shock arising from this situation, use an F & T trap and back-vent it to the top of the vertical line to maintain near-equal pressure throughout the riser, even if a slug of condensate forms. In both of the two previous cases, the condensing of steam downstream of the seal produced the acceleration. It follows that the likelihood of differential shock arising, and causing water hammer, is greater in uninsulated pipes, especially on outdoor systems, than in insulated pipes. Long runs of any kind between the heat exchange equipment and the trap can produce this situation, and should be avoided. Damaging water hammer may also occur due to differential shock whenever there is an improperly-dripped pocket ahead of a control valve. Condensate builds up in front of the valve while it is closed. When the valve is opened, the slug of condensate is driven through the valve and into the piping and equipment by the live steam. The placement of a riser and a drip trap immediately upstream of the control valve will prevent this rampaging slug. To control differential shock, you must prevent condensate seals from forming in bi-phase systems. Condensate lines must be sized correctly, and long vertical drops to the traps must be back-vented. The length of the lines to traps should be minimized, and the lines may have to be insulated to reduce condensing. The installation of a proper drip leg ahead of control valves will prevent differential shock from occurring when the control valve is opened after a period of closure. Careful attention to these few guidelines will prevent most water hammer. Prevent the sudden stopping of water in pipelines by closing manual valves slowly, and by installing spring-loaded, center-guided, silent check valves where appropriate. Prevent thermal shock by using a sparging tube wherever flash steam is discharged into condensate at a lower temperature, and by ensuring that heat exchanger tubes are filled from one end. Prevent differential shock in bi-phase systems by providing return lines that are properly pitched and have adequate size. Avoid draining equipment with long lines to the trap, and insulate condensate lines whenever necessary. Following these guidelines for the proper design and operation of your system will minimize the likelihood of the shocks that cause water hammer. This, in turn, will greatly reduce the likelihood of damage to your system, to your product, and to your personnel. For more information contact Mead O'Brien at (800) 892-2769 or visit http://www.meadobrien.com.